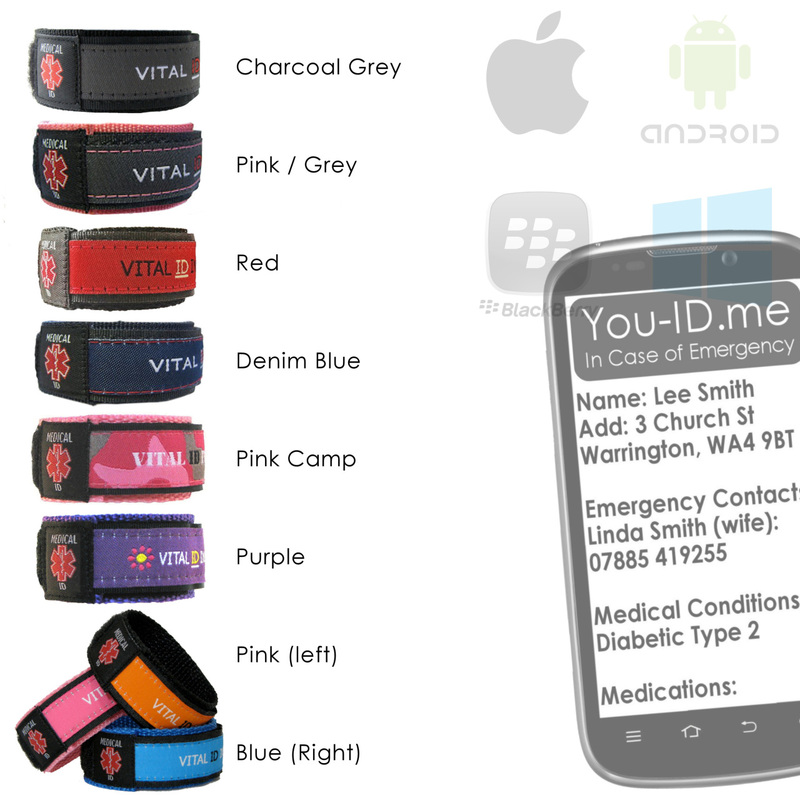 You ID Me is a powerful way to carry your emergency ID or vital medical information. Sign Up For a Year: Get Two Free ID Products! Buy You ID Me Service for 1 Year for £35.88 and Get 4 Years Free PLUS 2 FREE ID Products - Total Saving Over £186 !! Your medical conditions, medications, blood group, next of kin etc. 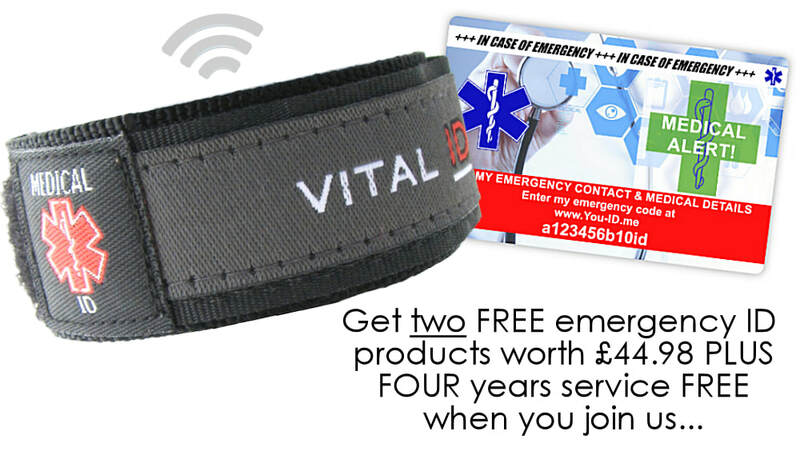 The usual total price for this offer would be £224.38 (Breakdown 5 years on platinum at £35.88 + NFC embedded wristband at £24.99 + NFC Emergency ID Card at £19.99). Purchase today for just £38.12 (£35.88 plus £2.24 P&P). Smartphone not included. Offer MUST End Soon. Postage for free items not included. GET TWO FREE YOU ID ME PRODUCTS PLUS FOUR YEARS FREE SERVICE! For your loved ones, knowing they'll be alerted quickly if you have a medical problem is very comforting. For you, knowing that in an emergency all your vital info is easily accessible to the emergency services and someone you know will be alerted is also very comforting. The special offer that follows offers peace of mind for yourself and your loved ones at a one time only price; everything you need for five years service from the UK's leading emergency ID service. All for only £35.88 - (Total saving £186.26. Offer expires soon). Whether you are a parent travelling with a young child, a person that exercises alone or someone with a medical condition You ID Me is faster and safer in an emergency. 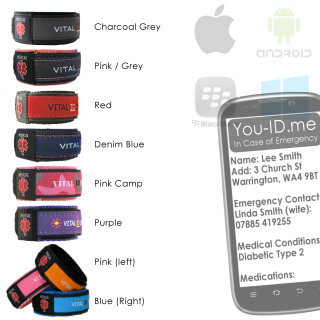 All our ID product are supplied with a unique ID code which becomes yours. We provide a number of different types of emergency ID products such as bracelets, ID cards, necklaces and key fobs. In an emergency a first responder enters your ID code on the You ID Me homepage. The vital details that you've registered are quickly displayed helping first responders / emergency services act fast & appropriately. What's the Family Alert Service? With a single click you can set your profile to immediately alert your family by SMS as soon as your profile is accessed if you are in an incident, accident or emergency. This service is exclusive to You ID Me and offers peace of mind to parents of young children, those with relatives with medical conditions or even partners of those who go out exercising alone. Customers tell us this positively alters an emergency. DON'T WANT TO BUY RIGHT NOW? Not ready to buy right now ? No problem. Register below and we'll send you occasional information. You might not receive the above offer again but at least you'll get to know us. We won't overload your inbox, we never share your details and you can opt out again at any time. © 2017 Ahead Solutions (UK) Ltd.